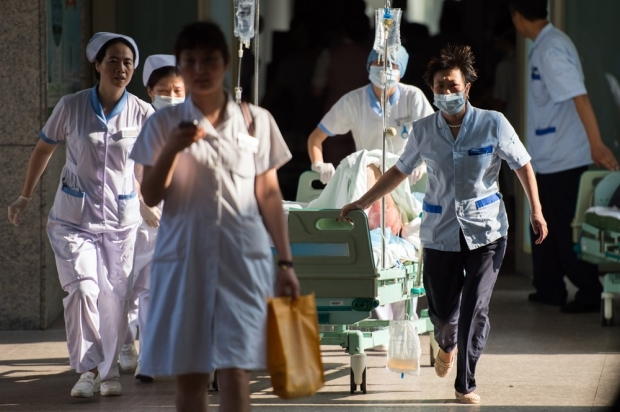 Doctors and nurses rush a victim of a factory explosion for treatment at a hospital in Kunshan on August 2, 2014. The explosion killed 75 people and injured 186 others as it ripped through a factory in eastern China. It was one of the deadliest industrial disasters in recent Chinese history. On August 2, a massive metal dust explosion killed 75 workers and injured another 186 at a factory in Kunshan, in Jiangsu province, that supplied wheels to General Motors. Asphyxiation killed more than 40 people almost immediately as oxygen in the production facility was consumed in an instant. Many of those who escaped suffered severe burns across their entire bodies as the flames instantly ignited the dust that covered their clothes and skin. According to Chinese media reports aluminum dust concerns at the factory, which is owned by the Taiwanese-invested Zhongrong Metal Products, had been an issue since at least 2010, when workers protested at the front gate over pulmonary infections and other diseases caused by dust inhalation. The production facility was full of aluminum dust. A worker named Liu Fuwen told a Beijing News reporter that every day before their meal breaks, each production line would fill a paint bucket with accumulated dust from their work stations. Another worker told Tecent’s InTouch Today, “When eating, each person’s body was covered in dust. It was like coming out of a brick kiln.” The factory’s managers would reduce production output on inspection day and wait until inspectors arrived to start up the machines, according to the South China Morning Post. GM distanced itself quickly. “[Zhongrong] was a supplier to a supplier, as opposed to us, so we are a couple of steps removed,” said GM President Dan Ammann. But global corporations selling major brand products understand factory conditions in their supply chains. Perhaps more so for GM, given its recent troubles with the safety of its ignition switches. The local government, for its part, failed to crack down on clear dust-related safety concerns at Zhongrong. Kunshan Fire Department official Wu Shenfei told The Beijing News that a fire broke out in June at the plant due to overheating of a dust removal machine. While factory workers put out the fire before it spread throughout the facility, firefighters learned what had caused it. One veteran factory worker told The Beijing News that Zhongrong was subsequently given a directive by the government to fix the dust-removal problem. That the factory’s management decided to ignore officials and continue production as usual is in part a failure of monitoring and enforcement bodies to compel compliance. Within three days, that article had garnered over 7,600 comments from netizens, many including scathing criticism of the government. The original version of the article was taken down between August 8 and August 10. Many reproductions of the article also quickly disappeared. But apparently censors were selective and did not delete every iteration of the exposé; it can still be found by using the original Caijing article’s title as a search term. While many of the news articles reporting on the Kunshan government’s advertisement language have been expunged from the Internet, many of the related posts and comments on Weibo have remained. Between August 5 and August 8, there were more than 700 results on Weibo related to the slogan “More exploitation, more happiness,” with some of those posts being shared dozens sometimes hundreds of times. Serious labor violations, almost a ubiquitous reality for China’s working class, rarely gather widespread attention and anger on Chinese social media. Most rights abuse cases are more or less confined to a small (yet growing) network of labor scholars and activists. But the Zhongrong tragedy and its ensuing investigation hit a nerve among those in the general public who feel that the country’s economic prosperity has been delivered by the government at the cost of equality and fairness. As the public discourse around blame for the Kunshan factory explosion turned from wanton companies and negligent local inspectors toward foundational issues of China’s constitution and governing principles, officials apparently took notice, taking down many news articles discussing the Kunshan government’s policy. We can hope that attention from the government will translate into political will for reform. The Zhongrong case should clarify again the need for legitimate worker representation. Until workers have a union looking out for them in their own workplaces, unsafe conditions and other labor violations will persist.